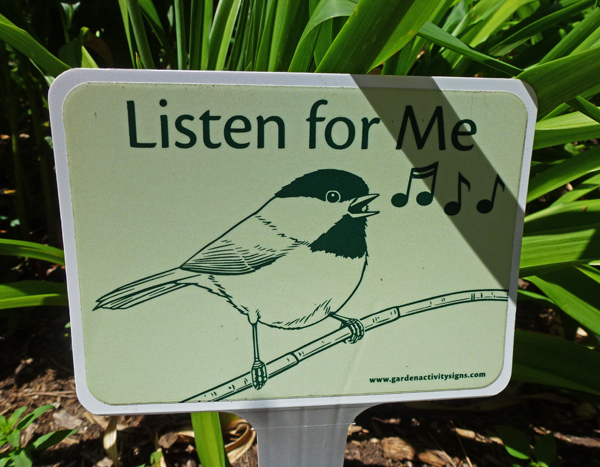 I spotted this little sign in a garden recently and thought it was perfect for these times when so many people are walking around with earphone on their heads. They can't hear other people let alone hear the birds! I like this sign, I am always listening for the birds. Happy Wednesday, enjoy your day! I couldn't agree more. I'd hate to be missing the songs of our little feathered friends. And the birds are so much more pleasant. What a great sign!! I love it! Have you noticed that there seems to be more birdsong this year?! I never have on a pair of headphones :) I always enjoy hearing the birds in the morning. Good sign. My Grandmother could identify most birds by listening to their songs. She had a good ear. You are so right Pat. People are shutting out the world around them.